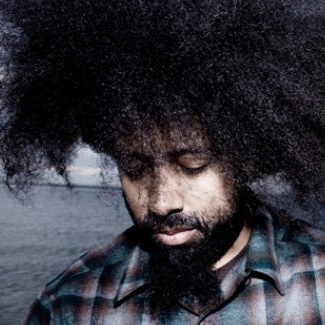 The hilarious, conspicuous, and always the life of the party Reggie Watts graced MetroSonic Studio with the role of recording a song that can undoubtedly be deemed one of a kind. Before moving forward, make note of this one fact: he is a one man band with several members, who happen to look alike and bare identical driver’s license numbers. Yes- he is so entertaining he can take over the role of an entire improv troupe. With that being said he can, and did, render everyone in the recording studio incapacitated with fits of laughter over 80% of the time, while he is diligently getting work done. In no way does this mean working in the studio isn’t entertaining, but to see tears from laughing isn’t the norm. No worries about the track though, it was recorded. Watts, ever the professional, was able to hold it together and get it done. The song aforementioned was the theme song to a new Comedy Central show. And it was done in the way that only Reggie Watts can do it. The show, “John Mulaney: New In Town” , debuts tomorrow… in all its uncensored glory. If for nothing else tune in just to hear the song. Watts sings as well as composes it. The definition of singing here is more funny commentary delivered in a rhythmic fashion. There is a ’70s groove, twist of soul, and a hilarious lyrical genius at work here. Here’s the take away– if the opening credits are that entertaining, how can one not tune in tomorrow or at the very least DVR it? Posted in Artists, Comedy, More Productions, Music Genre, Reggie Watts, Soul, TV/Film and tagged Brooklyn, Comedy Central, John Mulaney, Metrosonic, New In Town, nyc, recording studio, Williamsburg.